Acoustic desk top screens may be the quickest and least expensive way of addressing excess noise within the office as they are usually situated within close proximity to the source and offer a suitable barrier to break reverberation. Normal desk top screens offer a division and creation of work areas whilst acoustic screens absorb excessive noise as they have acoustic properties such as foam core, porous weave fabric and other tested materials. We often specify 'Cara' a fabric range by Camira Fabrics which is a plain weave fabric and made specifically for vertical panels and acoustic screens. Other screen manufactures specifically use their own fabric which may consist of wool or polyester and some are even made from recyclable fabric. 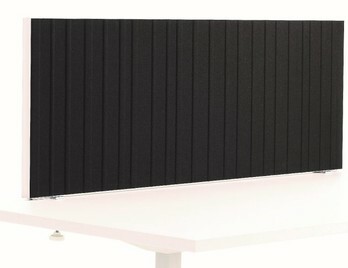 Mitesco acoustic desktop screen provides Class A sound absorption with stunning design detail. The screen is lightweight due to its frameless appearance and is sealed in the middle as the panel offers sound absorbent features on both sides. Screens from this family can be arranged and installed almost anywhere due to the various brackets available. They can be featured on walls, ceilings, windows and be used as standard freestanding room dividers whilst improving the soundscape of any environment. 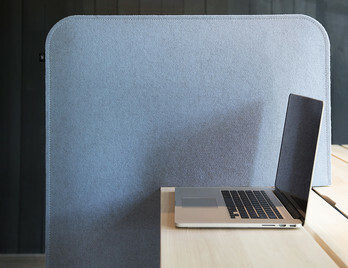 BuzziDesk FlipFlop Screen is a movable and foldable acoustic screen allowing the users to define a more personal and quiet hub for themselves. 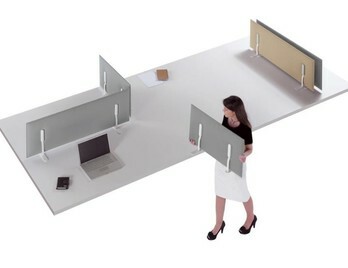 They can be used in the closed private form by pulling in the sides or can be set to zig-zag across the table surface. They can be stored flat against a wall with Fix Wall brackets when not in use as they flatten out completely when not in Zig-Zag mode. 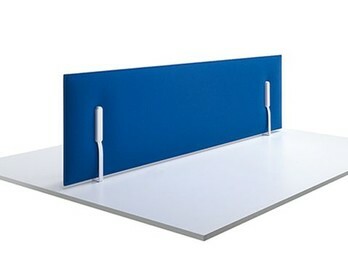 They are designed for any large table top or surface where privacy or personnel definition may be required. 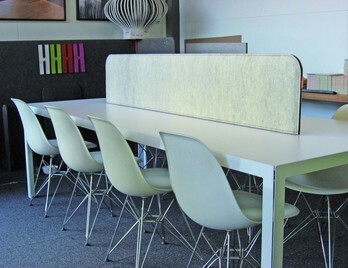 New from the Softline screen family is the Softline 30 acoustic desktop screen. The soft look still remains but the thickness has been slimmed down to 30mm to offer a more streamline and pleasing aesthetic. The Softline 30 acoustic desktop screen allows users to create various different layouts to create a comfortable acoustic environment within the office or workspace. A classically styled screen with subtle design detailing which is hard to overlook. With rounded corners and bevelled edge, the screens lend themselves to a natural elegance. 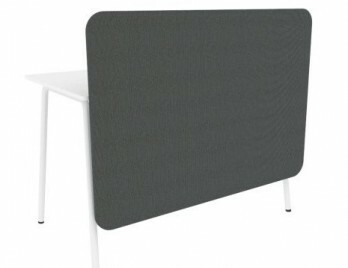 Made from fully recyclable materials, these acoustic screens feature a plain or block pattern with sound absorbent acoustic filling mounted on an aluminium frame. Delivered free of charge to the UK mainland. 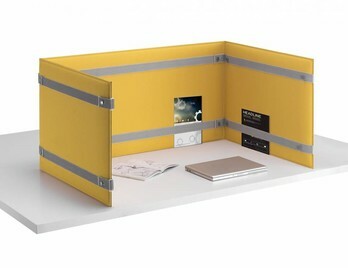 An acoustic workspace divider which safeguards your privacy at work or at home. A suitable solution for those wanting to hide their computer screen, computer and cables in an orderly fashion. 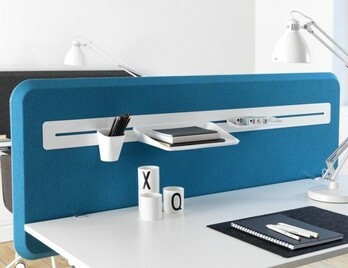 Available at three different heights and various widths to suit your workstation. 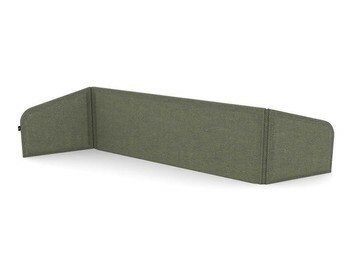 Pli Desk Top Screen is a sound absorbing screen, made up of a Snowsound panel or panels that can be joined together with elegant and stylish straps with button detail. The bands connect the panels via steel buttons and O-rings that create linear 'C' or 'L' or 'X' configurations. The Pli Desk Top Screen is ideal for those wanting to creatively create their own private space or work zones with the option to create multiple zones by linking them together. 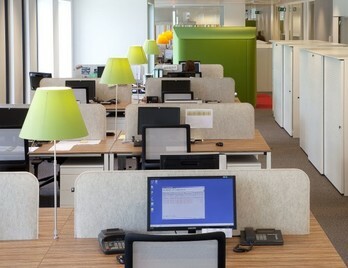 Modern acoustic screens do not necessarily have to fix to the desk top by clamps and can be placed on top of the desk or surface, having a screen or screens like this can make it easier for the user to define their workspace and easily block out areas from where noise may be affecting them. 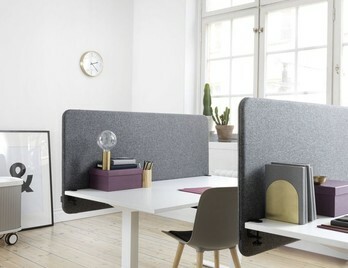 It must be said however that acoustic desk top screens will not completely absorb excess ambient noise as they are usually low enough to retain communication with your co-worker. Acoustic desk top screens are often required in busy offices and call centres as each worker or caller needs to retain focus and concentration with minimal distraction. If they find the excess noise is overbearing, due inadequate acoustic solutions, they may struggle to complete tasks or calls to a satisfactory level, leading to low morale and decreased productivity. It is paramount that the noise levels must be estimated before planning any call centre set up in order to protect workers from unnecessary noise and keeping stress levels in line with the noise levels, ideally low.